Hungarian potter Judit Esztergomi creates functional wheel-thrown and press-moulded tableware from high-firing clays. The wavy decoration connect all her work making in recognizable and giving it a classic feel. Arist and Silversmith Elizabeth Auriol Peers is insipired by the human form and creates unique forms demonstrating the playfulness of a curve, crevice or crease. Elizabeth uses chasing and a free-form raising technique to produce these folds, bulges and undulations that are iconic in her work and can be seen in the image above as well as our title image for this article. Miyu Kurihara, Frankfurt born and London based Japanese artist and graduate of the Chelsea College of Arts , showcased her handdrawn Ceramics and used video to demonstrate her process. Candice Coester from Burnt Earth Ceramics began working with clay 24 years ago in Johannesbourg, South Africa and trained as apprentice with Kim Sacks. 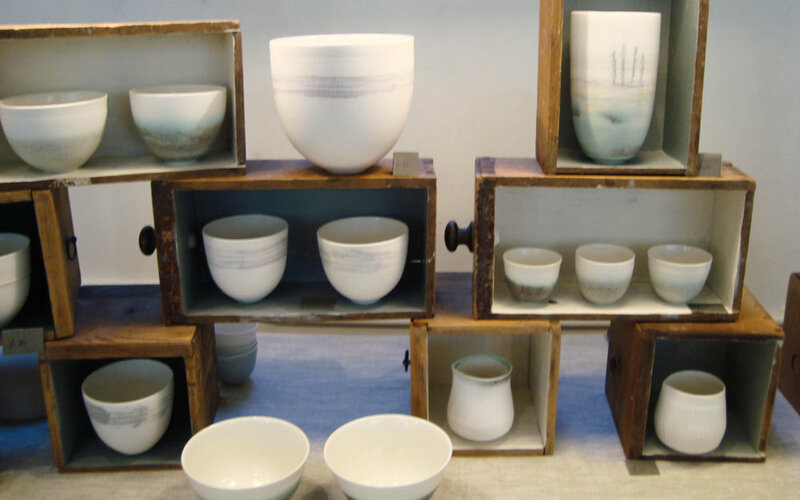 Her work is primarily thrown porcelain and stoneware, but she also uses handbuilding, pit-firing and using Naked Raku techniques. We especialy liked the landscape and horizon elements making the work very unique. Frances Stephens is carrying on a family tradion of now three generations that began with her great grandmother handweaving mohair in Northern Swaziland with one assistant, Sylvia Mantenga. The production has grown to employ 40 local women, producing hand prepared and handwoven home decor pieces that are imeless and elegant like these wall decorations. Sally McGill caught our eye for the colours and forms on display. The London based potter showcased her ceramics which stand our for the vibrancy of colours as well as the design. Brighton Jewelry designer Emily Thatcher gathers natural gemstones and creates unique pieces of jewellery informed by electron microscope images of the world around us. She creates bespoke settings that enhance all aspects of each stone used in rings, earrings & neckpieces and specialises in unique commissions and re-modelling work. Amy Cooper Ceramics is based in Cornwall but she ships her work all over the world becoming especially popular in the United States. Her beautiful unique procelain lightings are inspired by the world under the sea, the world under the microscope and the magic of landscapes at twilight. She adresses the fragility and transience of life and the natural world, through the transformative properties of light on porcelain and is inspired by the endless variations in nature and the idea of an ongoing evolutionary process of adaptation. Romer Designs combines traditional Japanese Shibori and other resist dyeing techniques with indigo, natural and modern dyes to create a range of one-off lampshades, homewares and scarves. Shibori is a slow craft, often with many hours of stitching, binding, clamping and pole-dyeing followed by more hours at the indigo vat or mordanting, dyeing and over-dyeing fabric to be transformed into lampshades, throws, cushions, table runners, napkins, scarves and other textiles. Dylan Bowen graduated from Camberwell School of Art in 1991 and set up his studio with Jane Bowen in 1998. Since 2002 he works in Tackley Oxfordshire. Dylan makes individual pieces in slip decorated earthenware, the work is wheel thrown and altered or handbuilt. Slips are poured, trailed or brushed on, mainly black and white slips with some green, it is then fired to around 1080c. in an electric kiln usually with a clear or honey glaze. Jane and Dylan Bowen also hold Slipware Courses at the St. Edwards School in Oxford. Born in Guadalajara, Mexico Iris moved to London in 2003 to study Jewellery Design at Sir John Cass Department of Art and Design at London Metropolitan University, followed by one year of the Master’s degree in Jewellery Design in 2010 at Central Saint Martins. Her jewellery designs are inspired by the folkloric spirit of Mexico, it’s naïve identity and vibrant combinations of colour. Another big influence can be found in 1960s graphic design for its use of bold colour, form and geometric shapes as well as pattern repetition, early plastic jewellery, everyday things and objects and the way they work, London, modern technology, inspirational people, beauty from nature: flora and fauna. 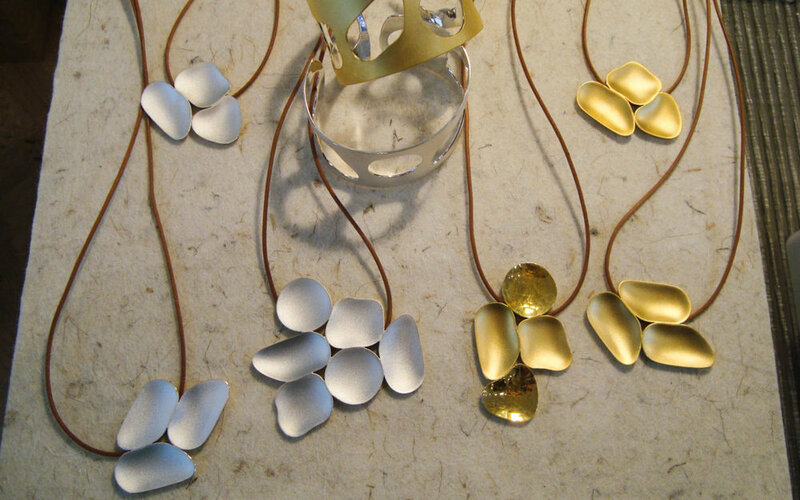 Amy Cooper is a jewellery designer/maker, making handmade contemporary jewellery from her Clerkenwell workshop. Her Spyglass collection is inspired by Victorian scientific instruments and a spyglass from a children’s story. Amy captures the magic and mystery of these objects in her jewellery and includes elements of movement to spark the imagination. 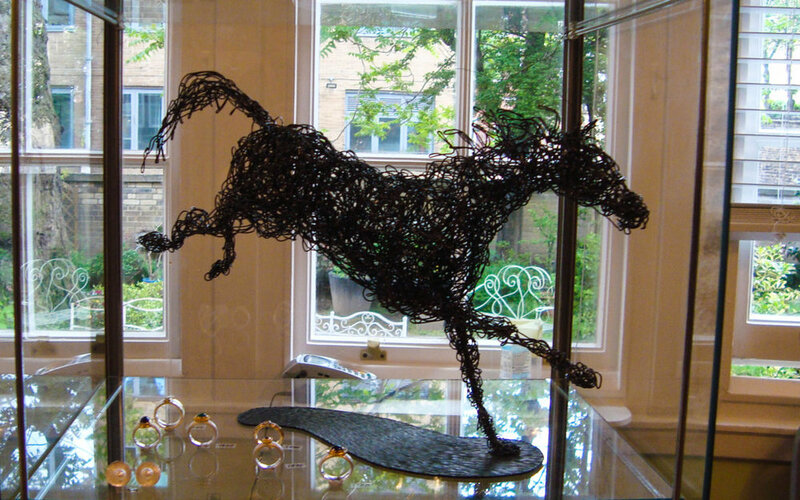 Scottish Jeweler Linda Lewin showcased both her jewelery as well as her beautiful wire drawn Horse Sculptures. Her jewellery is hand made in precious materials, gold, silver, stones. 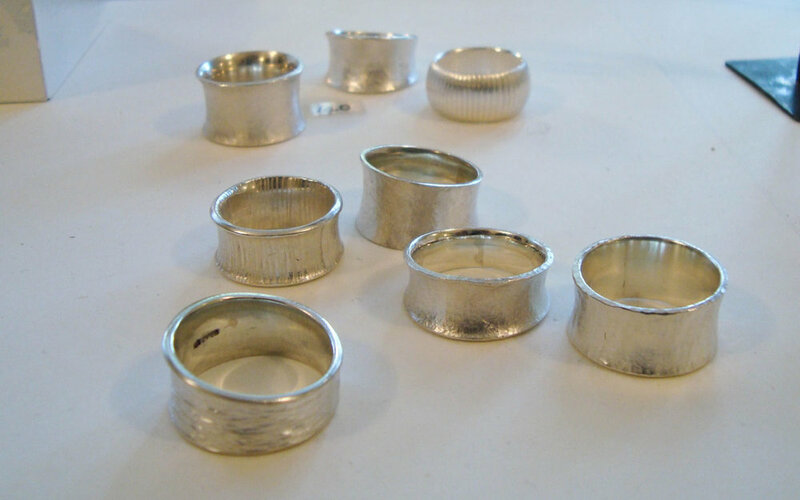 The silver bangles have been shaped with a hammer and imprinted using local whinstones. Dolly Clothes design, make and sell their unique clothing collection with all pieces individually made in their workshop in Lewes. The customer can pick & mix, chosing a style, trying a size and adding a fabric crom a collection of beautiful linens and cottons, indian blokprints and wools, colourful corduroy and utility denim. Melissa Simpson studied Manufacture and production of Leathergoods at Cordwainers College, London from 1987 to 198 and has worked in the leather industry for more than 29 years gain a very high level of expertise. All the bags, belts and smal leathergoods are designed and individually made by Melissa in her workshop using traditional and modern leatherworking skills, using the finest careful selected leathers that come from England,France, Belgium and Italy. Jeweller Juliet Strong’s wo is handcrafted made of all original designs, which are elegant, playful and, above all, tactile and sensuous to wear. Juliet draws her inspiration from landscapes, especially oceans and beaches, waves and ripples, pebbles and driftwood, leaves and petals, all elements which can be found in her work. Hat Designer Angelika Klose likes to reinterpret historical shapes and using modern fabrics as well as to constructing a hat by cutting and assembling flat material into sculptural 3D objects that can often be worn in various ways. 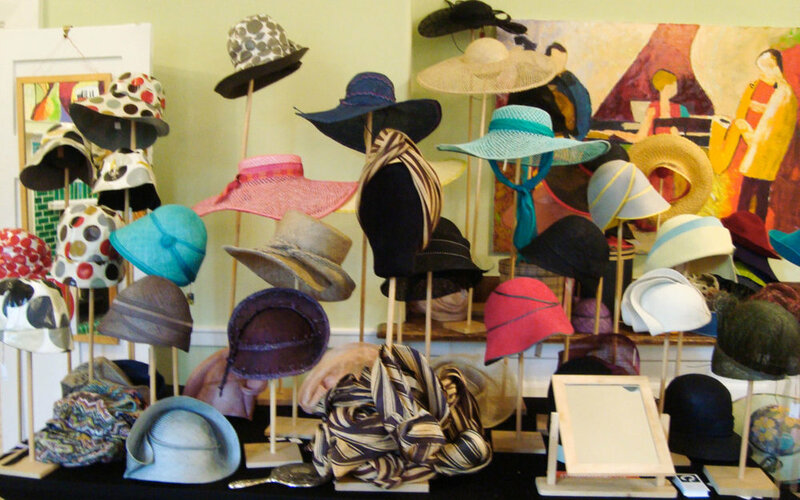 Angelika enjoys selling her hats in person and is passionate about finding harmony between the personality and individual look of the woman and the hat she is wearing. Sheffield bases Victoria Claire Dawes uses the potter’s wheel and slow repetitive mark-making processes, her practice is a meditation on the past as she makes tableware inspired by memories of her home. Drawn from a romanticised nostalgia for people and built from memories of the past at the beginning of new traditions, her tableware brings life on and off well-loved sideboards, growing in character as they pick up chips on their rims – the patina of a life well lived. Jane Sedgwick lives and works in rural North Norfolk, where she manages a small woodland with her partner, Tim. The woodland provides wood for fuel and a sustainable supply of timber. The inspiration for her mixed media jewellery is taken from vintage toys, modernist architecture, folk art and information graphics from the 50s and 60s. Use of geometric shapes, playful use of colour, repetition and order, tactility and movement are all recurring themes.